The National Institution for Transforming India (NITI Aayog), the think tank of the Indian government, and ABB India have signed a Statement of Intent (SoI) to support the Indian government realize its ambitious vision of “Make in India” through advanced manufacturing technologies that incorporate the latest developments in robotics and artificial intelligence. 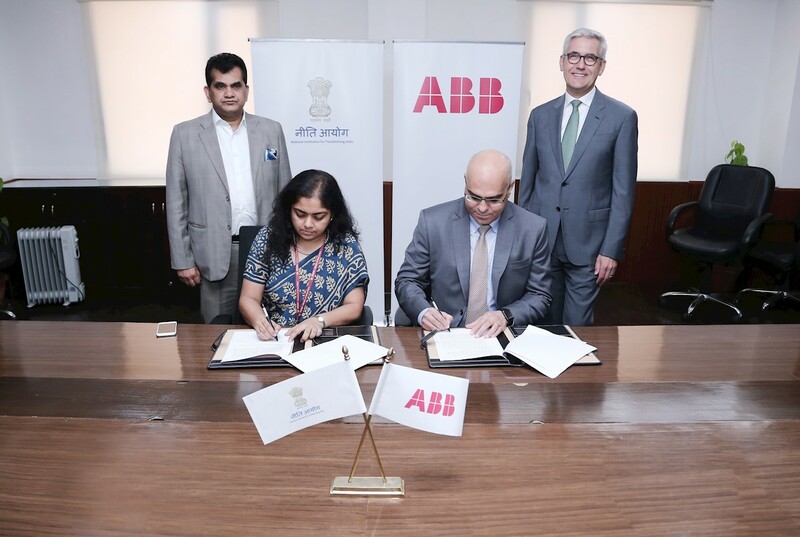 Anna Roy of NITI Aayog and Sanjeev Sharma, Managing Director, ABB India signing the statement of partnership in advanced manufacturing technologies, including digital and AI, in New Delhi today, in the presence of Amitabh Kant, CEO of NITI Aayog and Dr. Ulrich Spiesshofer, CEO of ABB. NITI Aayog and all stakeholders will experience hands-on experience of ABB Ability, the company’s comprehensive digital portfolio of solutions that deliver value of industrial digitalization to utilities, industries and transportation& infrastructure. ABB Ability integrates all of ABB’s services and domain expertise to turn data into analytic insights and direct action to drive competitiveness of Indian and global customers. The National Institution for Transforming India, also called NITI Aayog, was formed via a resolution of the Union Cabinet on January 1, 2015. NITI Aayog is the premier policy ‘Think Tank’ of the Government of India, providing both directional and policy inputs. While designing strategic and long term policies and programmes for the Government of India, NITI Aayog also provides relevant technical advice to the Centre and States. As part of a larger mandate to promote scientific endeavour and evolve a National AI Policy, NITI Aayog is establishing a series of partnerships with industry pioneers to promote indigenous advanced manufacturing, build capacity in frontier technologies and promote the ‘Make in India’ initiative of the Government of India.